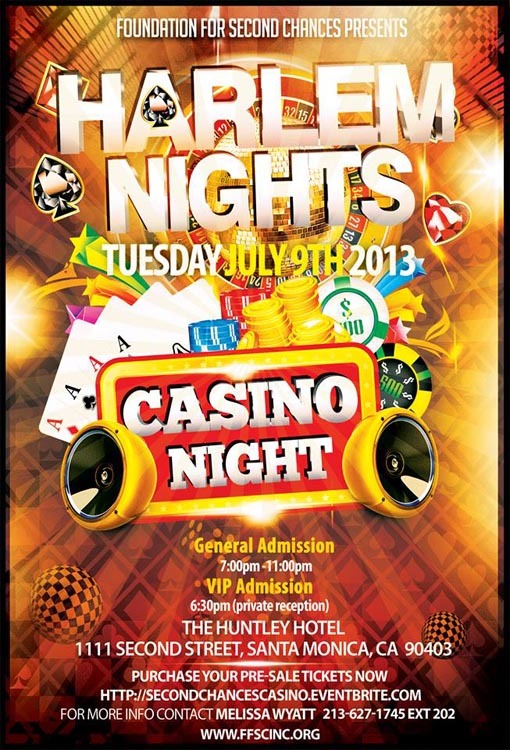 LOS ANGELES (July 3, 2013) — Foundation For Second Chances (FFSC) will host its Annual “Harlem Night” Casino Event on Tuesday July 9, 2013 to celebrate the work of FFSC and raise money for their educational and outreach programs. The red carpet soiree takes place at The Huntley Hotel located at 1111 2nd St, Santa Monica, CA 90403 from 7p.m.-11p.m. The mission of the event is to increase awareness and illustrate the importance of positive influences in the lives of children and young adults plus celebrate their culmination trip to Senegal, Africa attended by 17 at-risk youth from the Imperial Courts Housing Project who completed the 15-week Second Chances Leadership program. Hosted by Actor, mentor and philanthropist Dorian Missick, the evening is an opportunity for supporters and guests to gather among celebrities, learn about FFSC and try their luck at various games of chance. Highlights include: FFSC Red Carpet correspondent Actress Sundy Carter, celebrity meet-n-greet, live music by PLUSH, VIP reception, silent auction, hors d’oeuvres and cash bar. More than 250 people are scheduled to attend as the FFSC highlights the Second Chances Leadership Program, a collaboration with Grammy Award-Winning songstress Estelle. Pre-sale tickets for the event are available and can be purchased at http://ffscinc.org/event/casino. General admission tickets are priced at $100; VIP tickets are $150 and allows early admittance plus first grabs at high-end silent auction items. All tickets include: $100 in casino chips, 2 drink tickets and passed hors d’oeuvres with a $25 option to purchase $100 worth of additional casino chips. For more information on Foundation for Second Chances, visit: www.ffscinc.org. To apply for media credentials or submit talent for consideration, please contact Lisa Humphrey of Premier Concepts PR via email: lisa@premierconceptspr.com or call 310.605.5472. Foundation for Second Chances (FFSC) is a community based organization that utilizes hands-on education, mentoring, health awareness and community service to maximize the potential of youth. Second Chances’ goal is to make sure our children are given all they need to thrive. This includes a quality education, nutritious food and exercise, a safe and nurturing environment and the chance to give back to their community. The Second Chances Leadership program focuses on 15 weeks of curriculum and activities including mentoring, leadership, literacy, life skills and volunteering. The project will expand youth’s knowledge base by providing significant exposure to real life work experiences, hands-on activities that challenge their decision-making process and intense cross-cultural volunteer projects locally and abroad. The 2013 Winter/Spring cohort will end their 15-week program with a trip to Senegal Africa where they will continue to build on their leadership development. Premier Concepts PR (PCPR) is a full-service boutique firm specializing in Entertainment publicity for celebrities, special events, productions, lifestyle brands in addition to celebrity procurement and event coordination.